If you are looking for a back brace to help you cope with persistent back pain, it is important to first identify what is causing the pain. If the pain is chronic and has not yet been diagnosed by a medical professional, that should be your next step after reading this article. Typically pain can be traced back to several root causes: over-activity, disc injury, disc degeneration, degenerative spondylolisthesis, spinal stenosis, or scoliosis. In some instances back pain can be attributed to some very dangerous conditions including tumors and arterial disease. For this reason, it is critical you have the cause diagnosed by a medical professional who will be able to use imaging tests such as x-rays and MRI’s to accurately pin-point the underlying issue and rule out life threatening conditions. This is the first step to proper treatment for the back pain. 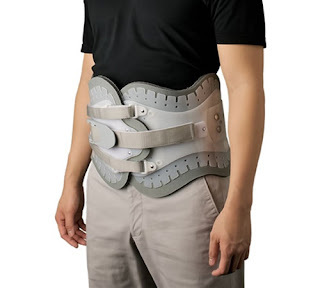 In most instances a medical back brace is an effective and affordable component of a comprehensive back pain treatment strategy. If you discover that you suffer from a slipped or bulging disc, a brace will not only provide support but it will offload pressure from the disturbed area. For others, if the pain is post-operative, a brace will not only aid with pain management, but it will also promote healing by limiting motion and providing support. Your spine consists of a spinal code and nerves contained within a series of vertebra, separated by intervertebral discs and facet joints, all of work together, allowing the spine to transfer nerve information to the brain and body parts while also permitting the spine to move. Back pain can typically be attributed to one of these spinal components behaving irregularly, leading to “pinched nerves” or strained muscles / ligaments. There are two types of back braces that are most commonly used to limit the motion in the spine, and they are rigid braces and corset braces. Rigid braces are exactly that: rigid – as opposed to elastic. A perfect example of a rigid brace would be TLSO braces. These firm, form-fitted braces are your best bet if limiting range of motion is your primary objective. They are typically constructed of stiff plastic and can limit motion by 50% or more, making them perfect fracture and post-operative braces. Because of their rigidity, these braces can be uncomfortable and are typically worn when upright, but not while sleeping. Corset braces are elastic braces which provide support while also allowing more give and their rigid counterparts. They are adjustable via elastic straps or corset styled lacing. Good examples of corset braces include lumbar braces and sacroiliac brace. About the Author: MMAR Medical Group Inc. is a wholesale distributor of orthopedic medical braces, comfort footwear and hot or cold therapy devices. MMAR offers one of the largest selections of quality medical braces in North America, including carpal tunnel braces and medical braces for pain and postoperative recovery.